Our fleet of modern Jaguar funeral vehicles provides families with comfort and refinement for a dignified occasion. The fleet consists of a Hearse and Three Limousines. 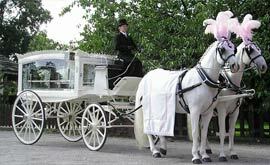 For funerals where more than three limousines are required, we arrange for additional vehicles from other sources. Each of our funeral limousines is able to carry up to six people in the back, with one extra space in the front if necessary. 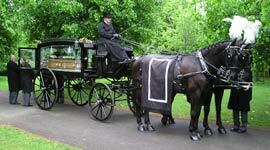 However, the front seat is sometimes reserved to provide transport for the minister or service officiant. If babies or children under the age of 12 (or under 135cm in height) are travelling in our limousines, the family will need to provide age appropriate booster seats for them. We are happy to carry fold-down wheelchairs in the limousine for those who are less able, but are still able to get in and out of a normal vehicle. We also have a wheelchair available for family’s use if you prefer. Please let us know if use of a wheelchair is required. 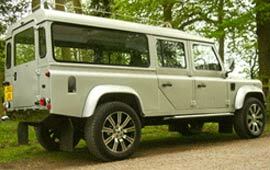 We also have access to modified vehicles for wheelchair users who are unable to access a standard vehicle. In addition to our own fleet, we have access to a range of other funeral vehicles to make the funeral even more personal. 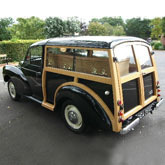 These include horse-drawn hearses and a horse-drawn mourners’ carriage, motorcycle side-car hearses, a Morris Minor hearse, or a fleet of land rover or Volkswagen camper vans adapted for use on funerals. If you are interested in using any of these vehicles please let us know as soon as possible, and preferably before the funeral date and time is arranged. Once the date and time has been arranged, we cannot guarantee availability.